Telehealth and remote monitoring of a patient’s health status has become more commonplace in the last decade and has been applied to conditions such as heart failure, diabetes mellitus, hypertension, and chronic obstructive pulmonary disease. Conversely, uptake of these technologies to help engender and support home RRTs has lagged. Although studies have looked at the role of telehealth in RRT, they are small and single-centered, and both outcome and cost-effectiveness data are needed to inform future decision making. Furthermore, alignment of payer and government (federal and state) regulations with telehealth procedures is needed along with a better understanding of the viewpoints of the various stakeholders in this process (patients, caregivers, clinicians, payers, dialysis organizations, and government regulators). Despite these barriers, telehealth has great potential to increase the acceptance of home dialysis, and improve outcomes and patient satisfaction while potentially decreasing costs. The Kidney Health Initiative convened a multidisciplinary workgroup to examine the current state of telehealth use in home RRTs as well as outline potential benefits and drawbacks, impediments to implementation, and key unanswered questions. Telemedicine is the exchange of medical information between sites via electronic communications with an aim of improving a patient’s health (1). A broader term, telehealth, encompasses nonclinical services, i.e., education, and is often used interchangeably with telemedicine (1). New technologies have broadened the scope of telemedicine applications and services, making these tools more accessible and useful in caring for patients at remote distances or for patients who may have difficulty visiting a clinic (2,3). These technologies include: synchronous two-way interactive video and device data/programming exchange, asynchronous communication (store and forward), remote monitoring sensors, electronic health record patient portals, and other modalities. These technologies hold the potential for improving outcomes through individualized patient-centered education, remote communication and data exchange, in-home clinical guidance and monitoring, prescription/treatment efficacy and adherence assessment, real-time modifications of treatments, and early alerts for problems needing intervention (3–7). There is interest in exploring whether telehealth can expand outreach and improve the care of patients with kidney disease, including patients with CKD, ESRD, and kidney transplants. ESRD care often occurs at dialysis centers that may be remote from hospitals or the main practice site or at home and thus are logical sites to employ telehealth because the care team may not always be physically available to the patient. Presumably, telehealth and remote management technologies may enhance patient autonomy by providing them unscheduled access to clinicians who can provide help. Similarly, it affords clinicians greater confidence that patients will receive appropriate and safe oversight at home. Recent changes in reimbursement policies have further stimulated the growth of home dialysis therapies, and the effective use of these technologies has potential to further enhance this trend (8). To facilitate discussion of these issues, the Kidney Health Initiative (KHI) initiated a project in May of 2015 to address questions in telehealth as applied to the care of patients with ESRD in the United States. A multidisciplinary workgroup was tasked with identifying: (1) the current state of remote monitoring/management and telehealth technology and envisioning future treatment of patients with ESRD; (2) outcomes that may be affected by these technologies; (3) potential economic value of utilizing these technologies in the care of patients with ESRD; (4) the effect of these technologies on improvements in quality of life, satisfaction with the RRT modality, time-savings, and convenience; and (5) the key regulatory, legal, and patient confidentiality concerns, as well as reimbursement barriers that may affect the adoption of these technologies. Although telemedicine has broad applications across the spectrum of kidney disease, the focus of the work was on ESRD, and specifically home dialysis modalities. The American Society of Nephrology and the US Food and Drug Administration (FDA) established a public-private partnership, KHI, in 2012 to advance scientific understanding of kidney health and to foster development of therapies for kidney diseases (9). KHI’s membership includes patient groups, health professional organizations, dialysis organizations, pharmaceutic and device companies, and government agencies. To advance its mission, KHI has initiated projects composed of multidisciplinary workgroups and emphasized five interconnected goals: (1) the advancement of patient and family partnership and funding of kidney disease; (2) biomarker and pathogenesis understanding in renal disease; (3) closer collaboration with the FDA and other government agencies; (4) clinical trial endpoint design; and (5) clinical trial infrastructure and developing the evidence base (10). The Advancing Technologies to Facilitate Remote Management of Patient Self-Care in Renal Replacement Therapy project defines the critical issues surrounding telemedicine for the patient with ESRD. Table 1 lists standard definitions for common telemedicine and telehealth terminologies. The KHI workgroup specifically focused on technologies, processes, outcomes, and costs associated with the communication of information between patient and caregivers over distance as applied to patients with ESRD (11). Technologic advancements have minimized barriers related to distance, resources, or limiting medical condition(s) (3,12). Patients can now seamlessly engage with their health care team using various technologies and both actively and passively provide key clinical data on their day-to-day health and treatment parameters. Technologies can be as simple as a conversation with video conferencing or as sophisticated as direct near real-time transmission of clinical parameters (i.e., BP and pulse) and treatment parameters (i.e., alarms or missed treatment targets from a dialysis machine). Encounters can be supplemented with physical examination tools such as electronic stethoscopes (13). Alternatively, patients can transmit data to their health care team for review and storage (i.e., automated peritoneal dialysis [PD] cycler treatment parameters). Using these communication tools, caregivers can remotely manage and modify treatments (i.e., prescribe new medications, reprogram a PD cycler or home hemodialysis [HD] device) with a goal of improving outcomes and avoiding patient decompensation and hospitalization through early and appropriate intervention (Figure 1). Nomenclature for commonly used terminologies in telemedicine. Modified from reference (1), with permission. Overview of care pathway with the use of telemedicine for patients with ESRD. The benefits of such technologies to patients with ESRD who receive their dialysis treatments at home can be substantial and may allow patients to maintain a high level of independence while simultaneously providing a strong support network to ensure good outcomes. Many of these benefits, although intuitive, are currently hypothetic and few clinical studies (Table 2 lists clinical studies in this area) have demonstrated specific benefits of telehealth services for patients with ESRD. The current literature in this are single center experiences utilizing telemedicine for the care of patients receiving HD (14–23) or PD (24–33). Thus, studies that address the utility of telehealth and include endpoints of interest to patients, providers, and payers (i.e., improvements in mortality, lowering of readmission rates, improved quality of life, and cost savings) are needed. Furthermore, attention to the potential negative effects of telemedicine such as removing the nonverbal clues seen in direct face-to-face encounters needs further exploration. We believe the potential benefits of telemedicine can be classified in the following ways. Despite data showing equivalent or superior outcomes and strong patient and family preferences for home-based dialysis therapies, the uptake of these modalities in the United States has been slow (34–36). This may be related to patient and physician insecurities about performing dialysis at home without readily accessed support systems (i.e., technicians, nurses, and physicians) (37,38). Telehealth, with the ability to provide two-way communication (including video capability), offers patients the ability to access their care team. It can provide a safety net allowing patients to have questions answered, concerns addressed, and feelings of solitude potentially alleviated. Surveys have also shown that patients are accepting of such technologies (39). Home dialysis therapies can present complex and confusing issues to patients and their home care partners. Telehealth platforms that utilize video conferencing may allow the care team to monitor patients while they perform self-care, provide feedback on patient techniques, and institute continuous education programs that help ensure survivability of the home dialysis technique through avoidance of complications such as peritonitis, catheter exit site infections, or needle-stick injuries. For example, a telehealth system for patients receiving PD has been reported that embeds best-practice care steps into a tablet computer application as well as providing the ability for the care team to monitor the patient performing PD exchanges (27). Patients using this system reported high degrees of satisfaction with these features. Remote monitoring of the home dialysis treatment affords the care team the ability to directly monitor patient-specific data (i.e., BP, weight) and treatment-specific parameters (Table 3). Treatment parameters and alarms captured in a store-and-forward manner by automated PD cyclers and dialysis machines provide a version of this form of monitoring. Such monitoring may give both patients and caregivers “peace of mind” that treatments have oversight and allow for troubleshooting when, or even before, significant problems develop. Presently, ancillary medical devices with wireless interfaces such as Bluetooth may allow for physiologic readings and treatment parameters to be captured and sent to remote monitoring stations for immediate review, or to storage at a “cloud-based” medical device data system. These systems can allow health care providers to assess any issues that may be associated with significant adverse events (40,41). Through both remote monitoring as well as two-way video-teleconferencing capability, the care team can interact with the patient and their home care partners to diagnose and troubleshoot solutions to various problems. For example, patients can send high-resolution pictures or video of their PD catheter exit site or drain bags for evaluation as to whether there might be signs of infection. Alarms indicating slow effluent drain times may identify PD catheter dislocation or entrapment. Such capabilities could allow for earlier diagnosis of problems as well as implementation of timely solutions. One of the potential promises of telemedicine relates to the current Centers for Medicare and Medicaid Services (CMS) requirement for a monthly face-to-face visit between patient and provider team, some of which could potentially be replaced by a remote visit (42). During this remote visit, the entire care team (nurses, social worker, dietician, and physician) could interact with the patient via two-way video. This could be of great benefit to stable patients who currently are required to travel to monthly face-to-face visits. This travel comes at substantial time and monetary expense for some patients and significant savings could be realized by this approach. An example of this approach was applied at the University of Iowa Stead Family Children’s Hospital where the addition of a monthly Skype remote visit supplemented with quarterly face-to-face visits led to yearly cost savings of approximately $5000/year for the patient’s family, as compared with monthly face-to-face visits, without any change in outcomes (43). The ability for patients to communicate with their care team is paramount in ensuring success and enabling the patient to feel secure in the home environment. Simple e-communication platforms, such as Skype, FaceTime, or ViDYo, allow such communication, but must meet stringent patient privacy regulations as dictated by the Health Insurance Portability and Accountability Act and the Health Information Technology for Economic and Clinical Health Act. Documenting these encounters in the medical record is important and helps ensure confidentiality. For example, ViDYo may be integrated into the EPIC electronic health record patient portal and may meet this need (44). Despite these obstacles, two-way communication between the patient and care team can offer great benefits in facilitating open communication, early identification, and problem-solving, and may increase patient comfort level, knowing that oversight and care is close at hand. Through the provision of a suite of telehealth services, patient satisfaction may increase with home therapies. Although small studies support the idea that patient satisfaction with telemedicine care for patients with ESRD will be high, further studies are needed in this domain (14–33). There are potential downsides to telemedicine in terms of perceived intrusion into privacy and depersonalization that will also need to be investigated. Although not demonstrated on a large scale thus far, the benefits of telemedicine in the care of the patient with ESRD may result in significant cost savings for the health care system as well as the patient and their families. These potential cost savings may result from: more patients selecting home therapies with a lower cost structure, decreased complication rates, and improved outcomes such as lower peritonitis rates, improved technique survival, and decreased time and costs related to transportation to the dialysis center. Lower hospitalization rates have been correlated with increased contact with physicians, which can be facilitated by telemedicine encounters. It also should allow a reduction of time spent by the team on fragmented patient care and allow the team to meet as a group to interact with the patient and their home support member(s), thus improving efficiency and communication. Future demonstration projects of telehealth must include cost analytics and address whether the potential cost savings are in fact realized. Table 4 lists the potential benefits and barriers of using telehealth for home-based dialysis patient care. Table 5 outlines the basic elements of the telemedicine visit for patients with ESRD receiving home dialysis care. Barriers are stakeholder-specific and will have to be addressed to ensure successful uptake of telehealth for patients with ESRD receiving home dialysis. For example, patients may not be accepting of technologies in their home if they feel they are too intrusive and compromise their privacy. Patient-specific capabilities for the use of applicable technologies need to be defined. Similarly, interactions must be culturally sensitive, and perceived as providing value for patients to continue to actively employ their use. Internet access may not be widely available in patients’ homes and thus may have to be provided for them. Regulatory issues and reimbursement for services provided through telehealth will also have to be addressed. The vast experience of telehealth implementation for other disease states, such as heart failure management, provides templates and pathways for development of solutions (45). However, there are cautionary examples where telemedicine has failed to improve outcomes, such as in a large heart failure study where a multidisciplinary approach, including telemedicine, did not lead to improvement in symptom burden, functional status, or health-related quality of life (46). The pace of telehealth growth in the United States has accelerated significantly since 2012. This has been aided by an increase in the number of states that have passed telehealth parity legislation mandating coverage of telemedicine by private insurers, as well as an increase in the number of covered telehealth codes by CMS. As in many other areas of medicine, future regulatory and reimbursement decisions will likely affect the uptake of remote management for home dialysis. In January of 2016, the monthly capitated payment codes for home PD were included as covered telehealth codes by CMS (47). These provided coverage only for patients living outside of a metropolitan statistical area or in a health care provider shortage area. Furthermore, these stipulated that telehealth couldn’t be used for home HD, because the vascular access must be evaluated in person on a monthly basis. This issue continues to evolve with new legislation being proposed on a regular basis and interested parties should consult with expert sources such as the American Telemedicine Association. In order to guide future reimbursement decisions, there is great need for studies that assess an endpoint of overall resource utilization including reduction in nonemergent transportation costs. For the latter, it has been estimated that annually almost $3 billion is spent on this for patients receiving dialysis (48). Furthermore, studies evaluating clinical outcomes and economic analyses associated with reduction in hospitalizations and rehospitalizations, technique failure, and peritonitis rates should also be undertaken to guide reimbursement. Figure 2 outlines a research agenda in these areas. 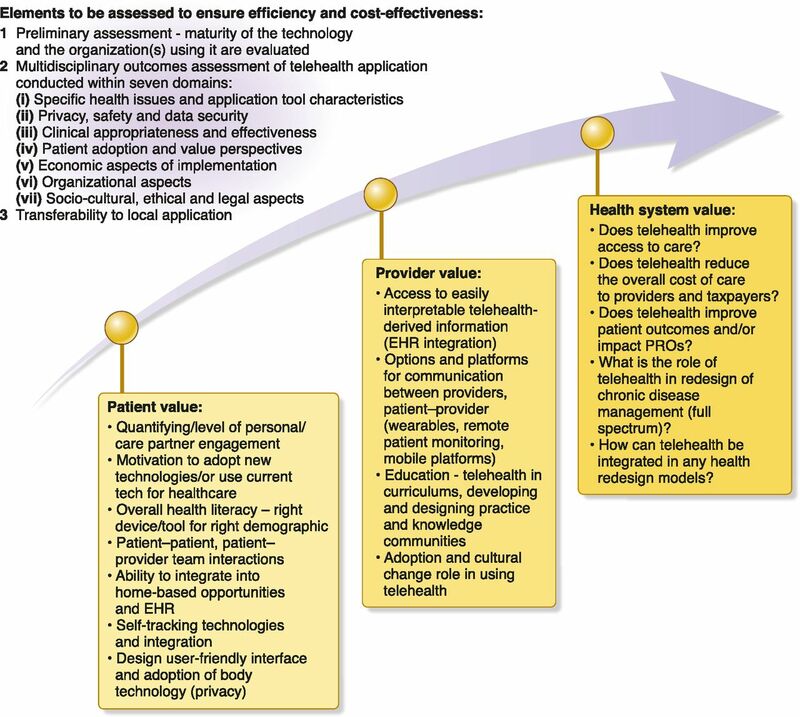 Research framework for assessing telemedicine technologies. EHR, electronic health record; PRO, patient related outcomes. Adapted from reference (56). Addressing several regulatory issues may facilitate uptake of telemedicine. Federally reimbursable telehealth visits require two sites of care: (1) the location of the patient, otherwise known as the “originating site,” and (2) the location of the clinician. Current regulations stipulate that the originating site has to be a medical facility such as a physician’s office, critical access hospital, or rural health clinic. It should be noted that this originating site couldn’t be another dialysis unit with the exception of in-center HD located within a critical access hospital. Although in traditional models of care the home is not an accepted originating site, the patient’s home may be the most convenient and perhaps the most appropriate “originating site.” In order for the home to be an originating site for the face-to-face visit, interactive videoconferencing equipment and internet with appropriate bandwidth or mobile technology would have to either already be available or provided to the patient’s home. Newer regulations have allowed for participants in a next generation accountable care organization to waive the requirements for the originating site, thus making the home an eligible site for select groups. However, demonstration projects testing the patient’s home as the originating site for telemedicine care are needed to best inform practice. Moreover, a strategy to broaden the reach of telemedicine services to all patients on the basis of need and benefit, irrespective of location, would be beneficial, convenient for patients, and will likely result in significant cost savings. The Chronic Care Management code (current procedural terminology 90940) allows for non–face-to-face management of patients with two or more comorbidities, one of which must be considered life threatening. It should be noted that for remote monitoring, there is no originating site criteria. Thus, the patient’s home can be used as a location for remote monitoring. However, ESRD is excluded from this reimbursement. Studies evaluating the efficacy of interactive monitoring in improving home dialysis patient uptake and retention and patient outcomes may guide policy related to remote monitoring regulations and reimbursement. Patients will have to have assurances that their privacy will be maintained and safeguarded. There are many issues to address in this regard. For instance, “cloud storage,” if utilized, would have to be secure and perhaps located in the same country as the patient. However, this is a critical issue to address, affording patients comfort that the technology is serving to improve their lives, and not as an intrusion. The KHI workgroup also explored factors requiring attention to expand the role of telemedicine for patients with kidney disease (Figure 2). These include demonstration of: (1) clinical benefit; (2) safety, such that care is not compromised by decreasing face-to-face interactions; (3) cost benefit; and (4) patient and care provider acceptance. Telemedicine promises to allow the realization of home therapies to increase independence, improve quality of life, and improve outcomes while aligning with patient and family preferences. Along the way, telemedicine may increase the acceptance and uptake of home dialysis modalities by providing reassurance that care professionals are available and monitoring key parameters of the dialysis procedure. Telemedicine may also improve post–kidney transplant and CKD care. Of course, this sanguine view may be tempered if patients perceive telemedicine as overly intrusive or if they feel that their care is depersonalized. To facilitate the widespread adoption of these technologies, studies will have to demonstrate the benefits of telemedicine and remote patient management for patients with ESRD. The regulatory and reimbursement landscape will have to adapt and align while privacy concerns are addressed. Infrastructure will also have to be easy to install, user-friendly, and affordable. P.B. : Current Employer: University of Iowa; Research Funding: Amgen, Abbvie; Honoraria: American Board of Pediatrics, Pediatric Nephrology Subboards, Continuous Renal Replacement Therapy University, Cincinnati Children's Hospital; Scientific Advisor or Membership: Clinical Journal American Society of Nephrology, Brazillian Journal of Nephrology, Pediatric Nephrology, Editorial Boards, Network Strategies and Innovations ESRD Board of Directors, American Board of Pediatrics. P.C. : Current Employer: American Association of Kidney Patients (AAKP) (uncompensated position); Honoraria: Milken Institute, ESRD Call to Action Retreat, travel/lodging, 2016; Rogosin Institute, Summit on CKD, travel/lodging, 2016; Centers for Disease Control Foundation, travel/lodging, 2016; Care/diagnosis (Dx), Patient Advisory Committee, travel/lodging, 2016; Humacyte, Patient Council, travel/lodging, 2016; Astellas, Patient Advocates Council, travel/lodging, 2016; American Society of Nephrology (ASN) Kidney Week, Expert Faculty, expenses related to travel and lodging, Kidney Week, 2015; Scientific Advisor or Membership: President, Member of Executive Committee, AAKP Chair, Patient Access to Pain Relief Coalition Board Member, Mid Atlantic Renal Coalition (ESRD Network 5) Board Member, Kidney Health Initiative (KHI) Member, Advisory Board, Center for Dialysis Innovation, Northwest Kidney Centers Member, Transplant Roundtable Member, Patient Advocates Advisory Committee, Astellas Patient Advisory Council, Humacyte Patient Council, Care/Dx; Other Interests/Relationships: Consumer and Patient Subcommittee Chair, Technical Evaluation Panel, Five Star Rating System for Dialysis Centers, Centers for Medicare and Medicaid Services (CMS), (lodging) 2015 Guest Participant, McNeil Over the Counter Pain Management Discussion, APCO Worldwide (lodging), 2015 *Expert Evaluator, CMS, Center for Medicare & Medicaid Innovation (CMMI) Comprehensive ESRD Care Initiative Grants, Large Dialysis Organizations (stipend), 2014 *Expert Evaluator, CMS, CMMI Comprehensive ESRD Care Initiative Grants, Small Dialysis Organizations (stipend), 2014. J.E. : Current Employer: University of Iowa Children’s Hospital. R.J.: Current Employer: Qualcomm Incorporated; Scientific Advisor or Membership: American Medical Association current procedural terminology Editorial Panel Sub-Working Group on Telehealth Coding. S.L. : Current Employer: George Washington University Medical Faculty Associates; Other Interests/Relationships: ASN: KHI, Network 5: Medical Review Board, CareFirst: grant. M.R. : Current Employer: University of Virginia; Consultancy Agreements: Johnson and Johnson, Abbvie, Otsuka; Research Funding: Otsuka, Kadmon; Honoraria: ASN, Baxter; Scientific Advisor or Membership: Editorial Board of American Journal of Kidney Disease and Clinical Journal of the ASN. N.S. : Current Employer: George Washington University Medical Faculty Associates; Other Interests/Relationships: Life365 Advisor, CareFirst Foundation Grant Principal Investigator. J.S. : Current Employer: Baxter Healthcare Corporation; Ownership Interest: Baxter Healthcare Corporation; Scientific Advisor or Membership: KHI Board of Directors. This work was supported by the Kidney Health Initiative (KHI), a public-private partnership between the American Society of Nephrology, the US Food and Drug Administration, and >75 member organizations and companies to enhance patient safety and foster innovation in kidney disease. KHI funds were used to defray costs incurred during the conduct of the project, including project management support. There was no honorarium or other financial support provided to KHI workgroup members. The authors of this paper had final review authority and are fully responsible for its content. KHI makes every effort to avoid actual, potential, or perceived conflicts of interest that may arise as a result of industry relationships or personal interests among the members of the workgroup. More information on KHI, the workgroup, or the conflict of interest policy can be found at www.kidneyhealthinitiative.org. The views and opinions expressed in this publication are those of the authors and do not necessarily reflect the official policies of any KHI member organization, the US Department of Veterans Affairs, or the US Department of Health and Human Services, nor does any mention of trade names, commercial practices, or organization imply endorsement by the US Government.